Ubiquitous and needing no introduction, the Toyota Land Cruiser Prado is currently in its 5th generation after its launch in 2014. This year the mid-size SUV has been given a refresh look like its more upscale cousins. The SUV’s commendable off-roading abilities are left intact, however. The newest iteration is on sale with either a 2.7-litre 4-cylinder engine making 164 hp and 250 Nm of torque or a 4-litre V6 producing 271 hp and 389 Nm of torque. The first engine can be had with one 3-door or three 5 door variants. The bigger 4-litre engine can be had with four 5-door and 7-seater variants. With impressive equipment levels, modern safety equipment especially on the top of the range Limited variant and great comfort, it remains a very good value for money option. Have a question on Land Cruiser Prado? Land Cruiser Prado is available in 10 different colors - Black, Silver Metallic, Grey Metallic, Super White, White Pearl Crystal Shine, Red Mica Metallic, Attitude Black Mica, Avant Grade Bronze Metallic, Vintage Brown Pearl Crystal Shine and Blackish Ageha Glass Flake. Watch latest video reviews of Toyota Land Cruiser Prado to know about its interiors, exteriors, performance, mileage and more. The Toyota Land Cruiser is a very popular branding from the company and has been so on a global scale. The Land Cruise Prado bears the example of the popularity. The car received a second facelift in 2018 and is already good to go for another couple of years. However, one of the best things about the Prado is the variants it is offered in. Unlike most other SUVs, it is offered in both 3-door as well as 5-door forms. Yes, the LC Prado is an SUV with 3-doors and five seats for the 2.7-litre to go with the standard 5-door model. However, the 4.0-litre variant is offered with the 5-door setup as standard. The base model misses out on many features which are otherwise given on the higher trims. Inside the cabin of the Toyota Land Cruiser Prado, things aren’t as feature-rich as one would expect it to be. Most of the top-class features are restricted to the higher variants with 4.0-litre engine. As for an example, the leather seat covers are given only on the top end VXR variant of the 5-door 2.7-litre while the 4.0-litre variant has them on the VXR and Limited trims. All the other variants have the fabric upholstery. The base variants have manual air-conditioning while the higher models have dual-zone automatic climate control (tri-zone for the highest trim). The Toyota Land Cruiser Prado is very different than the standard Land Cruiser in terms of the aesthetics. 18-inch wheels are given as standard across the variants and body type. However, the 5-door 2.7-litre trims have optional 17-inch wheels too. It is also quite significant to know that all the variants are built with different dimensions. The 3-door 5-seater trim is 4,505 mm long and 1,885 mm wide while the 2.7-litre 5-door variants measure 4,780 mm in length and the same 1,885 in width. Moreover, the 4.0-litre trim betters this by being 4,950 mm long but with the same width. All-wheel-drive being a standard addition to all the variants in the lineup, the Toyota Land Cruiser Prado offers amazing offroad capability. Also, the large 18-inch wheels have the thick 265-section tyres given as standard, something that comes in handy when you taking the uneven terrain. The suspension setup is good enough to not let throw you out of your seat when the bumpy rides comes up and also to maintain stability on straight roads. The response from the steering wheel has a good feel, especially on the bigger 4.0-litre variant. The Toyota Land Cruiser Prado is offered with two engine option - a 2.7-litre and the other 4.0-litre. The smaller motor has an inline four-cylinder setup and can make 161 horsepower and 246 Nm of torque. On the other hand, the bigger engine has the V6 cylinder setup and can churn out a better 271 horsepower and a higher 381 Nm of torque. As for the transmission, a 6-speed automatic is standard in both the units. Having said that, the smaller engine gets a 5-speed manual while the bigger version comes with a 6-speed manual. The range-topping trims have a long list of safety features on offer, though the number dips for the lower level. Starting off from the safety of the occupants, there is child restraint system (AKA ISOFIX) and dual front airbags, along with curtain, side and driver’s knee units too. Apart from this, the driver gets a lot of assistance programmes like hill start assist, hill descent control, cruise control, etc. Additionally, there is a rear-view parking camera along with sensors for the front and rear. There is a multi-terrain monitor system that has four cameras. Blind spot detection and rear cross-traffic alert make life easier for the driver. The Toyota Land Cruiser Prado is a true mid-size SUV to be had, especially because of the number of options it comes with. It competes against the likes of Mitsubishi Pajero and the Nissan Pathfinder. However, it is slightly more expensive than them and starts at AED 129,000 while ranging to AED 190,000 for the top trims. What is the price of Toyota Land Cruiser Prado? 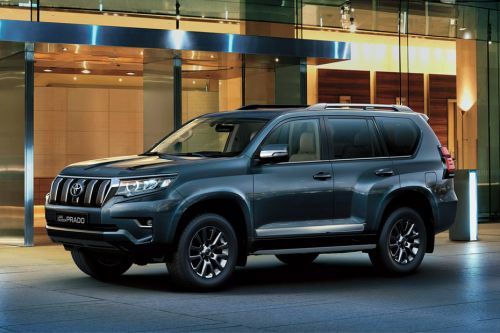 On road prices of Toyota Land Cruiser Prado in starts from AED129,900 for base variant 2.7L 5-Door EXR, while the top spec variant 4.0L 5-Door Limited costs at AED204,900 . What are the colors options available in Toyota Land Cruiser Prado?